If you happen to ever to come across an application that goes by the name Nicer Together, make sure not to download or install it under any circumstances. Our research team highly advises you to do so as it has been found out that this program is yet another adware that will ruin your web browsing experience. Make sure to ignore claims that might be stating that this piece of software could be beneficial since it should improve your online experience by presenting you with great discount deals, coupons, and promotional codes. Even though it sounds like a program worthy of running on your computer, you must know that in reality it does not perform in such a way. All that this adware is capable of is causing tons of disruptions virtually every time you surf the web. While such interference is the most prominent feature of this ad-supported program, you must know that in some cases it could turn out to be the reason other dubious application might be able to enter your computer without much trouble. Only by terminating Nicer Together will you be able to restore the normal functionality of your web browser. Since the official website of Nicer Together does not host a direct download link, it is safe to assume that this ad-supported program is distributed in some other questionable way. During the investigation, our malware experts have discovered that in most cases it is spread via software bundles. Such way of distributions is extremely common among the malware developers since software bundles exploit the fact that users tend to skim through the installation procedure; thus, consequently allowing a setup of some dubious program to take place. You must be aware of the fact that in the majority of cases bundled installers are acquired from unauthorized third-party sites; if you stick to official vendors’ website only, you will be able to significantly reduce the risk of infecting your PC in such a way. Also, you should always learn as much as possible about a program that you wish to have on your computer before even obtaining it. This is critical as malware developers nowadays use deceiving marketing strategies in order to lure unsuspecting Internet users into obtaining their questionable software without realizing how it really works. If you consider yourself a security-conscious user, you must have a reliable antimalware tool on your computer at all times since it can detect and warn you about any questionable installers or websites in advanced. 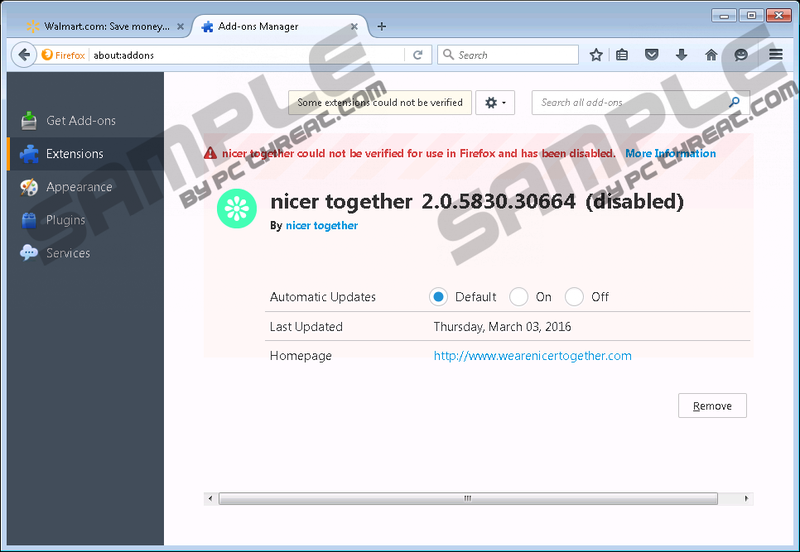 If you suspect that Nicer Together is up and running on your computer, you should now that the primary indication of it being active on your PC is an unusual amount of unwanted third-party web content presented to you within your web browser. As soon as this adware enters your operating system it will implement browser extensions to major web browsers such as Mozilla Firefox and Internet Explorer. The extensions are used to initiate connections to adware servers, which are the main source of all that invasive content, which is mostly presented to you as third-party commercial ads, coupons, and pop-ups. It is important to highlight the fact all of those ads, pop-ups, and coupons are not only annoying but could turn out to be malicious in a certain way as well. During our research procedure, it has been found out that this ad-supported program could present ads or pop-ups that might be embedded with redirect links. This is an instance that holds a huge risk because by clicking on a seemingly harmless ad you could be redirected to a website that might be set up by malware experts, implemented with an arbitrary code execution exploit. Just landing on a website that runs such an exploit is sometimes enough to get your PC infected with some dubious program. It goes without saying that Nicer Together imposes major virtual threats; thus, its removal must be executed at the very same time that it is found running on your computer. Make sure to perform a complete removal of Nicer Together without second thoughts. If you fail to do so, you will leave your operating system at constant risk of getting infected. Follow the removal guide that we present below carefully. If you make even a single mistake, it could mean that the removal of Nicer Together has been incomplete. It is a situation that you should avoid since the adware program in question at times could function by using just a few leftover files and registry entries. To be sure that everything associated with Nicer Together has been removed from your computer you should conduct an in-depth analysis of your PC for potential leftovers linked to this intrusive program right after the manual removal has been executed. Select Nicer Together and click Remove. Quick & tested solution for Nicer Together removal.